Canada Thistle (Cirsium arvense) Affects Herbage Production in the Northern Great Plains (2017). Travis R.Carter and Rodney G.Lym. Invasive Plant Science and Management. Abstract: Canada thistle can cause greater than 50% yield loss in small grain crops, but little is known about production losses when the weed invades pasture and wildlands. Change in grass, forb, and woody species production from Canada thistle infestations was evaluated in two separate studies in North Dakota. The first measured change in production following aminopyralid applied at 120 g ha−1 to control Canada thistle at two prairie sites. In general, grass, broadleaf, woody, and total plant yields were similar between treated and untreated prairie, regardless of the near-complete control of Canada thistle following aminopyralid application. Grass yield increased by 365 kg ha−1 the year after treatment at one location, with no change in forb or woody species production. Plant production was also estimated at 20 ungrazed wildland preserves located within two Major Land Resource Areas (MLRAs). Similar to the prairie sites, minimal differences in production between Canada thistle–infested and noninfested sites were observed. The only exception was an increase in grass production of 425 kg ha−1 at one of the MLRAs, with no change in broadleaf or woody species production between the Canada thistle–infested and non-infested sites. In contrast to cropland, pasture and wildland production of other species was not consistently reduced by Canada thistle. FIGURE: Economic threshold for control of Canada thistle with aminopyralid applied at 120 g ha-1 based on forage response at Fargo and the Rolling Soft Shale Plains in North Dakota in 2015 and 2016. Maximum stem density at the study sites was 27 stems m-2 in Fargo and 35 stems m-2 in the Rolling Soft Shale Plains. Gray segments were an extrapolation beyond observed Canada thistle densities to estimate cost-effective stem density required for treatment based on forage response. 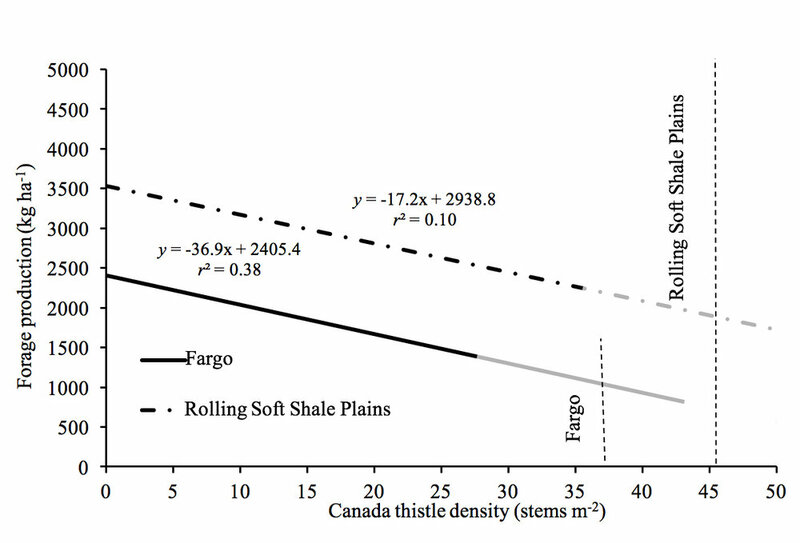 The standard error of the mean was 10.1 and 8.3 at the Fargo and Rolling Soft Shell Plains locations, respectively (Rod Lym, personal communication 2018).